Researchers from the National Astronomical Observatory of Japan, the University of Tokyo and Japan's AstroBiology Center used the Okayama 188-cm telescope in Japan to observe the planet K2-3d, located 150 light-years away, as it passed in front of its star. The measurement marks the first time the potentially habitable planet was measured from Earth. A potentially Earth-like planet circles a bright star 150 light-years away, casting a shadow tracked from space — and now from Earth, too. The planet, called K2-3d, was originally seen crossing in front of its star by NASA's Kepler space telescope during that instrument's ongoing K2 mission. 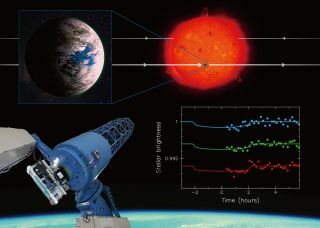 Researchers brought the Okayama Astrophysical Observatory's 188-centimeter (6 feet) telescope to bear on the speck to fine-tune their understanding of the exoplanet's orbit down to a precision of 18 seconds, according to new research. K2-3d is about 1.5 times the size of Earth and orbits a star half the size of the sun every 45 days. The exoplanet circles closer to its star than Earth does around the sun — one-fifth the Earth-sun distance — but because this is a cooler star, the planet should rest at an Earth-like temperature that could host liquid water, National Astronomical Observatory of Japan researchers said in a statement. That space around a given star is known as the habitable zone because it has the potential to support life similar to that found on Earth. Kepler discovered the planet based on the star's slight dimming as the planet passed in front, from the telescope's perspective — a process of discovery called the transit method. Because Kepler's K2 mission examines patches of the sky for only around 80 days each, researchers could observe K2-3d crossing the star just twice. But the planet is closer to Earth and has a brighter host star than most of the other potentially habitable planets discovered by Kepler, researchers said in the statement, so K2-3d was worth a second glance. NASA's Spitzer Space Telescope observed two more transits, further increasing what researchers knew about the planet's orbit. K2-3d's star is much brighter than those of other transiting planets in the habitable zone spotted by Kepler, making this planet a good candidate for further examination. Along with Kepler planets and planet candidates, represented by the black and white circles, the chart shows two Earth-size planets located 40 light-years away and observed by a ground-based telescope. Despite its closeness to Earth, K2-3d is small enough that the dip in brightness of its star is still extremely faint, only a 0.07 percent change. That's near the limit of what ground-based telescopes can detect, the researchers said, but Okayama's MuSCAT instrument could collect light from three different wavelengths and so could detect that flicker, thus clarifying the orbit to within just 18 seconds. Each transit presents a chance to learn more about K2-3d, and this new work allows researchers to forecast when those transits will occur. Upcoming large-scale telescopes like the James Webb Telescope will be able to analyze the starlight shining through the planet's atmosphere during a transit. They will thus be able to detect molecules like oxygen that can indicate the potential existence of life. The new work was described Nov. 21 in The Astronomical Journal.